The run on traditional-style bathrooms and kitchens continues to slow to a crawl. Home designers and builders say contemporary-style kitchens and baths are getting more and more traction in American homes. So is technology. Americans prefer clean-lined, bright kitchens and baths that leverage technology and safety, according to the recently released National Kitchen & Bath Association’s (NKBA) 2017 Kitchen & Bath Design Trends Report. There’s something about a good soak in the tub, and the more technologically equipped a kitchen is the better. Technology in the home continues to grow, and it’s not just limited to living area. Almost a third of NKBA professionals say they have included wiring and pathways for future tech integration in the kitchen. Internet-connected appliances and docking stations are trending upward. A popular demand by homeowners is to conceal power outlets using power strips under cabinets. Outlets on backsplashes are not as desirable, said one respondent. NKBA members also report more use of distributed video and audio and wiring pathways for future integration. Until now, that’s been a luxury in the bathroom. Also, accessible and/or universal design features integrated to improve kitchen functionality are becoming more popular. A blast from the past – metal cabinetry – is making a comeback in kitchens. In some cases, designers report increased interest in metal cabinets, similar to those that were popular more than seven decades ago. Younger and male designers most frequently specify metal cabinets, according to the survey. Darker, high-gloss cabinets are emerging in the kitchen, even though lighter colors are most preferred, and younger designers like a splash of violet or purple in the bath. Also, two-toned kitchens are taking shape. Bathrooms with whites, off/whites and grays are preferred, say NKBA members. Blues, violets and purples are emerging, as well as smoother cabinet and furniture styles. High-gloss finishes are more popular. 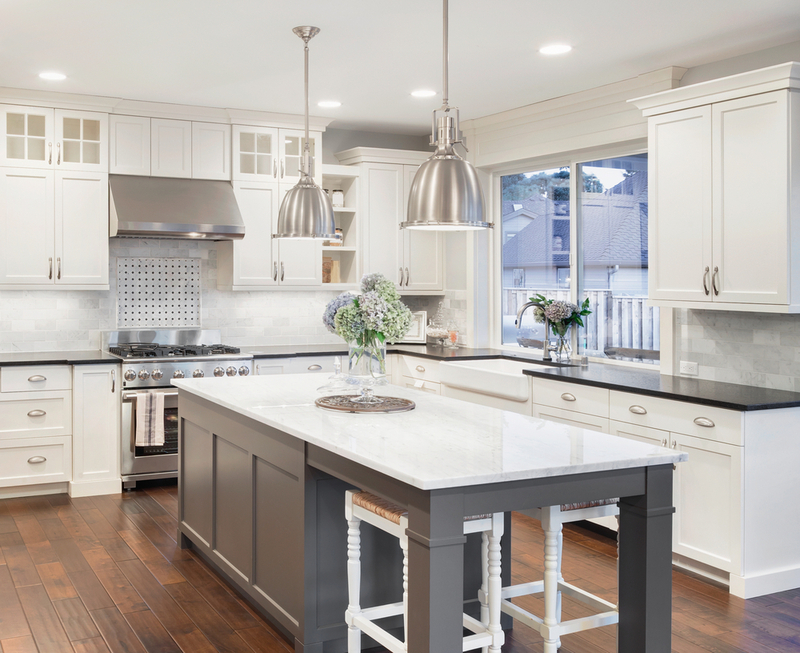 Quartz is trending up as the most popular kitchen countertop material. Granite, which is second, is trending down. Whirlpool and standard tubs are falling in favor of freestanding or soaking tubs. More than half of NKBA members said they’d removed a whirlpool or standard tub, and as many specified uses of freestanding or soaking tubs. Darcy says that trend should continue in 2017. The survey notes that about 60 percent of designers say they’ll recommend freestanding or soaking tubs. Also, high priorities are safety, comfort and ADA-compliant features in master baths. More designers are including comfort height toilets and countertops, shower seats, shower lighting and no-threshold showers. “ADA-compliant features in master baths are not really new, but they are now trending so people can stay in their home as they age,” said one respondent.